The Phillies win streak has ended at 4 games after an awful 6-1 loss to the Braves in Atlanta last night. After a lead-off single from Jimmy Rollins in the 1st inning, the Phillies scored their only run of the game. It all went downhill from there. Pitcher Cole Hamels had one of the worst starts of his career immediately after signing a huge $144 million contract. He walked a career high 6 batters, 3 of which came in the 2nd inning and led to 2 runs for the Braves. Of course, those 2 runs could have been avoided if Mike Fontenot had not made a gigantic error at 3rd base. He missed a routine ground ball that would have ended the inning without a run scored. Third base has been a total nightmare for the Phillies with Placido Polanco’s constant back issues over the past 2 seasons. Polly is on the DL again and neither Fontenot nor Ty Wigginton are able to handle the hot corner. 20% off all Phillies errors this year have happened at 3rd base. So the troubles at 3rd continue as do the trouble with playing error-free baseball, starting pitching woes and a sluggish offense. The other problem the Phillies are facing? How about Brian McCann. This guy is a 1-man Phillies wrecking crew. In 6 games against the Phillies just this year, McCann has hit a home run in EVERY single game, including 1 grand slam. He has 16 RBI against the Phillies in 2012…so far. So my question then is, why are the Phillies still pitching to this guy? Walk him! Hit him with a pitch! Throw darts at him! I don’t care…just please stop pitching to the guy! Tune in tonight at 7:10pm to see if the McCann curse continues…ugh. As far as headlines go, the one above is not what Phillies fans generally expect to see. But it was a back-up player and a much maligned bullpen pitcher who saved the day for the Phillies on Wednesday night against the Reds. It took more than six hours and nine pitchers, but the Phillies finally pulled out a 5-4, 19-inning win. Both offenses struggled to score runs and for the Phils, this has been problematic all season. I have two words rattling around my brain in regards to the Phillies offense: frustrating and painful. This team has been painful to watch most of the season so far. And they keep repeating the same mistakes over and over, which is incredibly frustrating. For example, Raul Ibanez led off the sixth inning with a triple. So with NO outs and a man on third, what should happen just doesn’t. Carlos Ruiz swung at the first pitch and popped out. John Mayberry Jr. watched a called-strike three go by. And then Wilson Valdez is walked intentionally to get to the pitcher. Result: NO run, when all they needed was a sac fly or some form of contact with the ball that did not turn into a pop-up. And this is exactly the sort of thing that is plaguing the Phillies offense. They faced a Reds pitcher who was off his game and they did not take advantage. Instead, they got themselves out by being impatient and swinging at bad pitches. So just like Tuesday night, with a 3-1 lead, the Phillies watched the Reds come back to tie the game, 3-3 by the seventh inning. They got hurt, again, by Jay Bruce with two outs and the bases loaded. He hit a two-run single off Roy Halladay, who had a few issues tonight. However, the defense behind him did little to help. But once the game entered the wee hours of the morning, many forgot that Halladay had even started the game. The bullpen took over for a total of 12 innings. 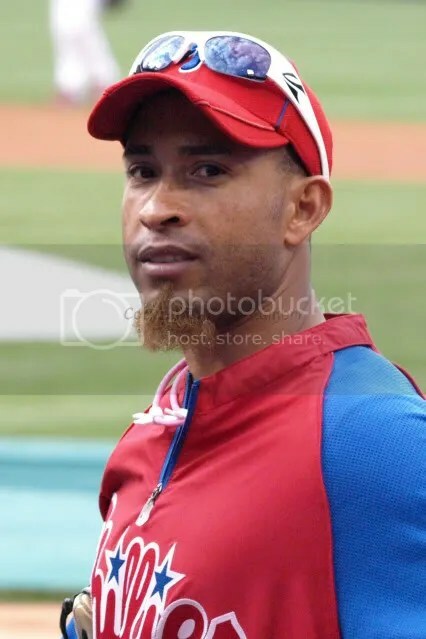 Danys Baez, who has taken a lot of abuse from Phillies fans for his lack of consistency, was one of the hero’s in this game. He pitched a career-high five innings and 73 pitches to carry the Phils through the 18th inning. He allowed only one hit, one walk and zero runs. Last year, Baez was so bad that many hoped he would be cut. And this year has been up and down for him. But rest assured that after an effort like this, Baez is keeping his job. After Baez exited, the unexpected happened. Wilson Valdez stepped onto the pitcher’s mound. And he was tasked with facing the heart of the Reds line-up in Joey Votto, Scott Rolen and Jay Bruce, who had absolutely been killing the Phils all series long. But Valdez gave a valiant performance, even clocking over 90mph on the radar gun. He got Votto to fly out to deep center, hit Rolen with a pitch and then two more fly-outs to end the inning. As he exited the field, the crowd went crazy cheering for him. Valdez is the first player to start in the field and move on to pitching since Babe Ruth. Seriously. He is also the first Phillies position player to pitch since Tomas Perez did it in 2002. The game win went to Valdez and afterwards he told Comcast Sportsnet, “I like to win,” in response to why he agreed to pitch. He also joked that he could have gone three or four more innings. Raul Ibanez hit a sac fly to score Jimmy Rollins for the win in the 19th inning. In a game where an infielder pitched, a catcher (Carlos Ruiz) played third base and the team left 16 men on base, this win has to be a huge boost for the Phillies. The last game with the Reds comes quick after this one; Thursday afternoon at 1:05pm. Cliff Lee will pitch. Ross Gload is not playing right now due to a slight muscle tear in his hip. This is same sort of injury that Chase Utley played through in 2008, which eventually required surgery. Gload is expected to play through it as well. Jose Contreras should return to the team sometime this week. Odds are good that David Herndon will be sent down to make room. Chase Utley got a day off today, except for a pinch-hitting appearance, in what appears to be an effort to err on the side of caution by not pushing him too hard, too soon. He should play again Thursday. 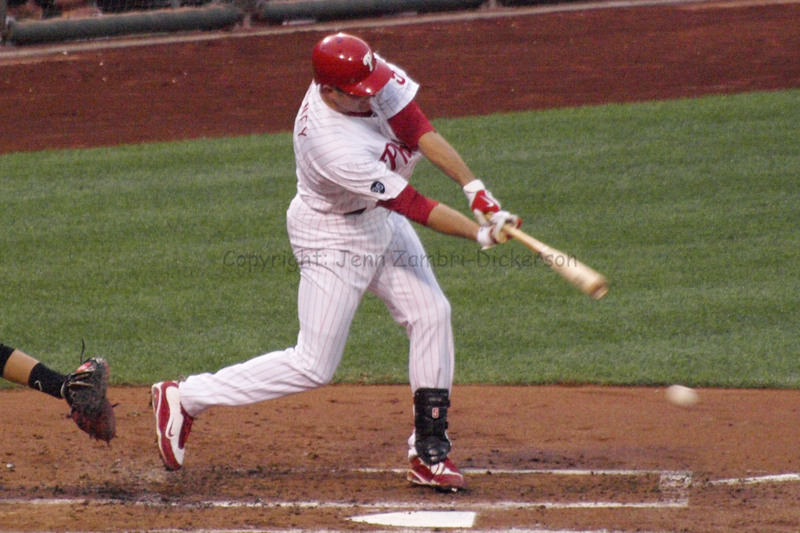 The crowd went wild as Chase Utley stepped to the plate for his 2011 debut tonight against the Reds. After missing the start of the season with knee issues, the Phillies have anxiously awaited the return of their leader. 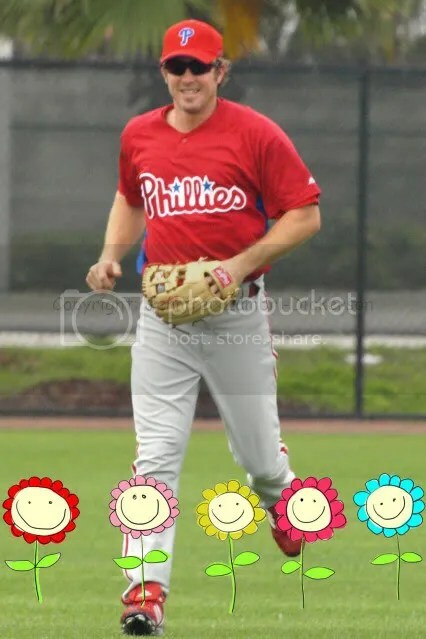 It was so thrilling to see Utley back in the line-up, fans everywhere felt like skipping joyously through a field of wildflowers. The overwhelming exhilaration poured onto the field and bled over into the Phillies recently dreadful offense. Runs began to pour out like rain drops. The Phils scored ten runs tonight, which equaled the run total of their last seven games combined. Oddly enough, the only starter in the line-up, including the pitcher, to not have a hit was Utley. He went 0-5. But just his presence alone was motivation for this struggling offense. Domonic Brown got his first hit since being called up. Carlos Ruiz racked up three hits. Both Raul Ibanez and Placido Polanco had two hits and two RBI each. And Jimmy Rollins put a charge into his bat with two hits, including a three-run homer. Cole Hamels started the game and did well until he allowed a three-run homer in the fourth to Jay Bruce. Hamels went six innings, allowing five hits. Because of the huge Phillies lead, he was able to come out of the game early and take a little break. 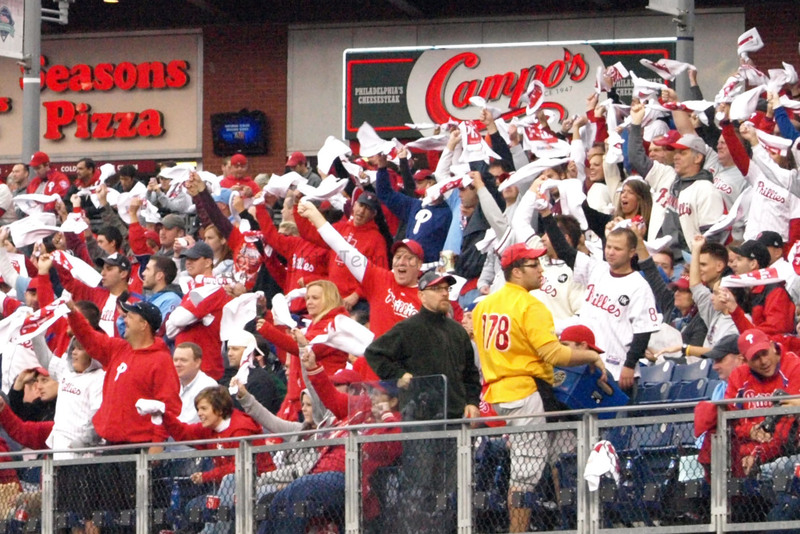 Phillies fans had a blast tonight, cheering for Chase and finally seeing some offense. As an added bonus, they were able to boo Scott Rolen, which was the icing on the cake. The Phillies won by a score of 10-3. The question now is can this offense take the huge momentum that Utley provided and carry it over from game to game? I will be at the ballpark Tuesday night to find out and I shall return with photos. Game time is 7:05pm; Vance Worley gets the start. December 15th is a historical date. In 1794, the United States Bill of Rights became law. In 1933, the 21st Amendment went into effect, legalizing alcohol. Russians landed on Venus in 1970. And now, in the year 2010, Cliff Lee re-signed with the Philadelphia Phillies. The signing will obviously not impact our society in such way as the Bill of Rights or the 21st Amendment once did. And it is doubtful that December 15th will be named a national holiday. However, this is still a historic occasion for the City of Philadelphia. The following is a list of five ways in which the Cliff Lee deal has made a positive impact on the team, the city and the fans. The entire Phillies team just got a whole lot better. 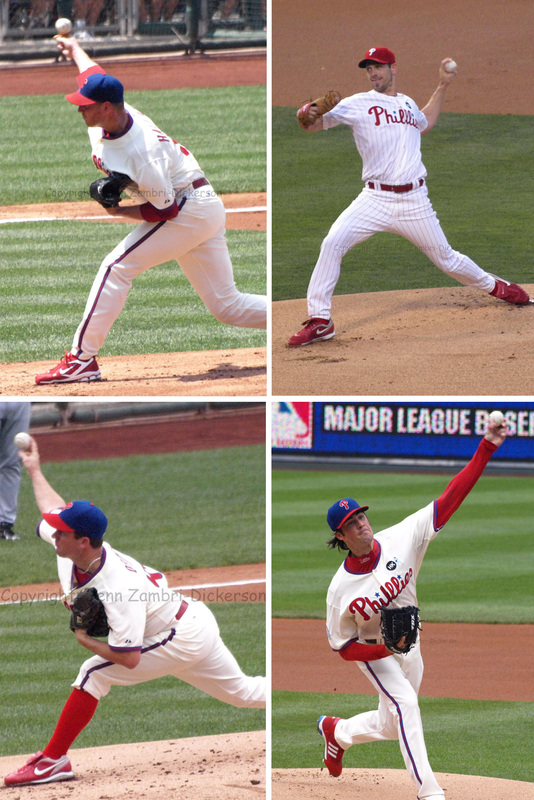 Adding Cliff Lee to the already dominant rotation of Roy Halladay, Roy Oswalt and Cole Hamels has the potential to make the opposition weep like children. All together, that makes 3 Cy Young awards, 13 All-Star appearances plus an NLCS and a World Series MVP title. Combining all four starter’s 2010 ERA’s comes out to an average ERA of 2.86. If they stay healthy, this rotation will be frightening. Statistics aside, these are four very competitive pitchers who will push each other to do better. This type of healthy dynamic should inspire the entire team to work harder and expect more from themselves and their teammates. Having solid starting pitching also takes a great deal of pressure off the offense. Players who can relax at the plate will be more productive. After a down year in 2010, this Phillies offense should be ready to explode. The City of Philadelphia and their sports fans constantly get a bad rap in the media. Focusing only on the negative, national press makes Philadelphia look like a war zone. Yes, some horrible human being threw up on a little girl at a Phillies game. The Eagles snowballs and Santa disaster begs the question, will the media ever get over it? That was in 1968. It is officially time to let it go. There are idiots everywhere, not just in Philly. Look at the Cubs fan who threw beer on Shane Victorino during a play in the outfield. Ask the family of the poor teenager who was killed after a San Francisco Giants game in 2008. But these are isolated incidents and by no means do they reflect the attitudes or actions of an entire fan base. Lee loves Philadelphia, the team and their fans so much that he took fewer contract years and less money to play here. 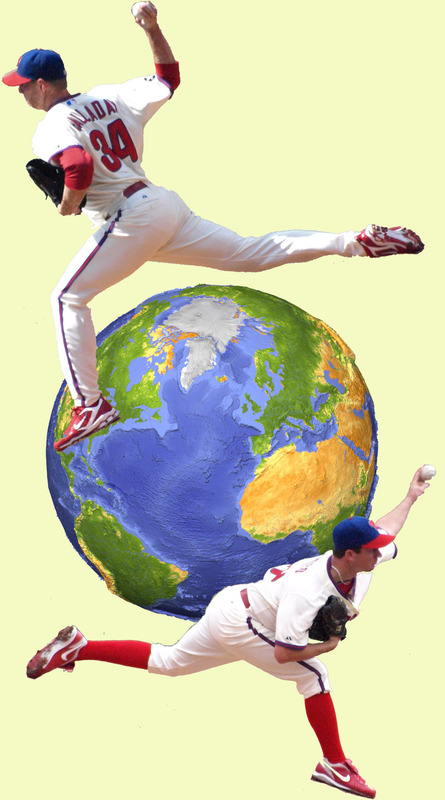 Much to the dismay of the national media, Cliff Lee has finally given Philadelphia the respect it deserves. Along with the respect that Cliff Lee’s words and actions have delivered, this signing has also put the Phillies on the wish list of all major league players who are interested in winning. The days of JD Drew, who was drafted by the Phillies in 1997 but refused to sign, are long gone. No more grumblings from the likes of Scott Rolen either, claiming the Phillies have no desire to win. The Phillies were already on the minds of many players before the Cliff Lee signing. Roy Halladay made an exception to his no-trade clause last year to come to Philadelphia. Later in July of 2010, Roy Oswalt did the same. But the Cliff Lee deal puts the Phillies in a whole new echelon. They are now able to compete with the likes of the Red Sox and Yankees. The Yankees lost out on Lee despite offering more money and additional years. So while the Yankees payroll still far outweighs the Phillies, in terms of status, they are now nearly equals. There was a lot of groaning among Phillies fans when All-Star right fielder Jayson Werth signed a gigantic contract with the Washington Nationals. Fans having flashbacks to Werth’s monster home runs, a steal of home plate, his rocket arm nailing runners at the plate and the 2008 World Series win, were disappointed that the Phillies did not try harder to sign him. The facts now show that had the Phillies re-signed Werth, Cliff Lee would not be on the team. They simply would not have had the money or resources to bring Lee back. Pitching wins ballgames. The impact Lee will have on this Phillies team in the long run far outweighs anything that Werth may have delivered. 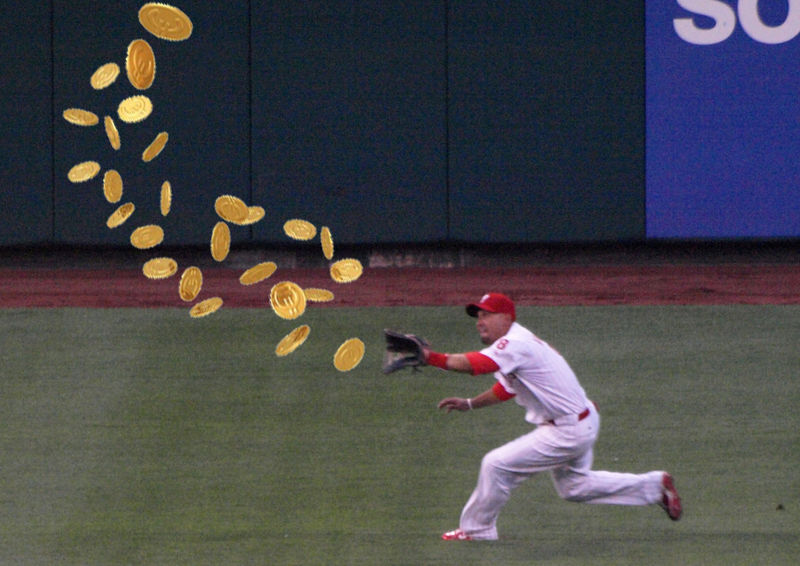 Werth went where the money was and no one can fault him for that. But that move further illuminates the magnitude of Lee’s decision to sign with the Phillies for less money. Lee will be appreciated by Phillies fans everywhere. Werth will simply fade away into a distant memory. 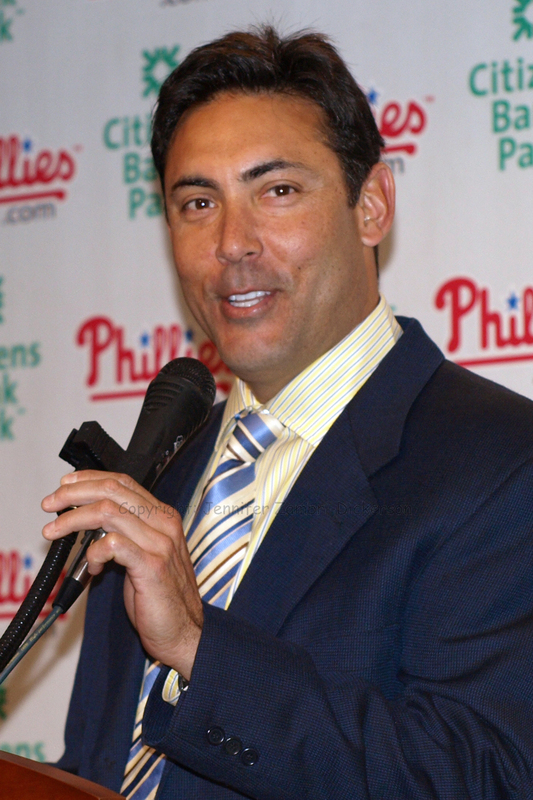 A Philadelphia native, Ruben Amaro Jr. started out as a Phillies bat boy in 1980. His father, Ruben Amaro Sr., was the first base coach at that time. Prior to that, Amaro Sr. played short stop for the Phillies from 1960-1965. Amaro Jr. also played for the Phillies from 1992 to 1993 and 1996 to 1998 in the outfield. He became the Assistant GM right after his playing career ended. Currently the Phillies General Manager, this man has literally spent almost his entire adult life, and part of his teenage years, with the Phillies. Many were unsure of how Amaro would fare in the GM spotlight, having taken over the job right after the 2008 World Series. Amaro was doing a pretty average job but did not score big until wrapping up Roy Halladay last offseason. Most were thrilled with the Halladay signing. However, the happiness quickly turned to shock when it was announced that Cliff Lee was traded in order to replenish the farm system. 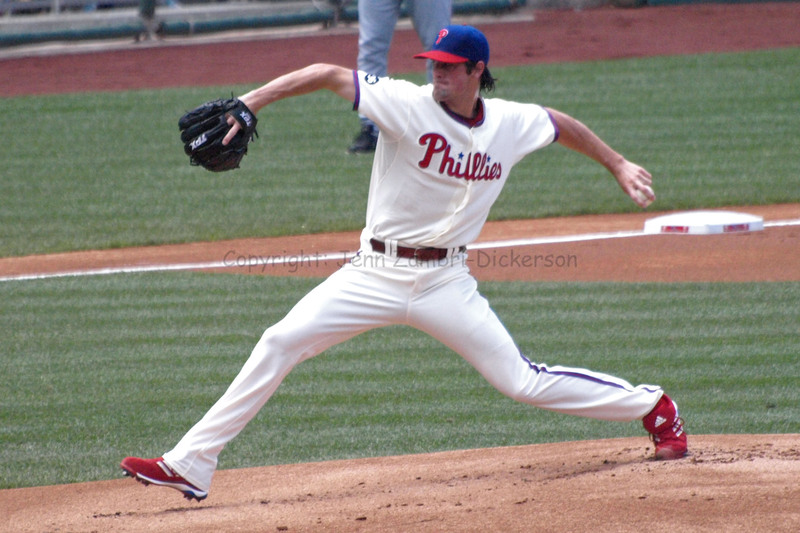 The short half year that Lee spent with the Phillies in 2009 was enough to enamor him to the entire fan base. His easy-going and unwavering demeanor on the mound combined with his ability to mow down opposing batters made Lee a fan favorite. He was also the only Phillies pitcher to record a win in that year’s World Series, which they ultimately lost to the Yankees. To say that trading Lee was a stunning blow to the fans is an understatement. Even months later and well into the 2010 season, people questioned the move. Some even went so far as to proclaim it the dumbest move Amaro would ever make. And while those people may be correct, Amaro created an extreme reversal of fortune by re-signing Lee on December 15, 2010. The five-year, $120 million dollar dear with a sixth year option completely redeemed Amaro. Amaro jumped though a number a very large hoops to make this deal happen. The biggest of those had to be convincing team ownership, who have been notoriously stingy in the past, to cough up the dough. This will be the highest payroll carried in Phillies team history. Respect is not easy to come by in this business, but Amaro has now earned it. He is a formidable opponent in the eyes of other ball clubs and to his own staff and players, he is a true leader. More than that, Amaro has earned the trust of this organization. They know he wants to win both now and in the future. The Cliff Lee deal has cemented Amaro’s place in Phillies history. All he is missing now is his very own World Series Championship. The third game of the NLDS between the Phillies and the Reds was not terribly action packed. Both teams pitched well and hits were at a premium. But while the game was not super exciting, the outcome certainly was. With a victory, the Phillies swept the Reds right out of the playoffs. As the chosen starter for game 3, Cole Hamels was anxious to show what he could do after an unbelievable no-hitter by Roy Halladay in Game 1. Hamels pounded the strike zone all night and sent Reds back to the dugout one by one. He allowed 5 hits while striking out 9 batters for a complete game shut-out. No quite a no-hitter, but Hamels was amazing. Plus, the final out was made by ex-Phillie Scott Rolen; icing on the cake. As for the offense, the Phillies got off to an early lead thanks to another Reds error. As a team, the Reds have committed 7 errors in 3 games of this NLDS. Tonight it was an Orlando Cabrera throwing error after Jayson Werth put the ball in play that cost them a run. Cabrera had a sore rib cage and was not supposed to play. But after some magic massages today, Cabrera was in the line-up. About the massages, Cabrera said, “The guy’s name is Andy. I don’t know his last name.” Do you think afterwards Cabrera left a few dollars on the bedside table and left? Poor Andy must feel cheapened by the encounter ;o) But we are all thankful that Cabrera felt well enough to play. Thanks, Andy…you deserve some credit as well. The other run for the Phillies came off the bat of Chase Utley who sent the ball to right center; it snuck over the wall for a homer. Replay was used to verify the homer as the Reds claimed a fan interfered but ultimately, the run counted. With Hamels holding down the Reds, the two runs were all they needed. With the 2-0 win, the Phillies will advance to the NLCS against either the Giants or the Braves, depending on the outcome of that series. The Giants currently lead the series, 2-1. The Phillies started the postseason with 2 pitchers named Roy in the first 2 games. In each of those games, the 2 Roy’s were polar opposites in terms of performance and results. Roy Halladay pitched a no-hitter in his first ever playoff game. Roy Oswalt on the other hand, with prior playoff experience, did not pitch well at all. But all is well that ends well as the Phillies went on to win anyway. At the start of the game, Oswalt looked pretty bad. He threw balls right down the middle of the plate and the Reds did not miss them. Oswalt surrendered 3 earned runs and 1 unearned on 5 hits and a walk. Chase Utley made 2 throwing errors in the 2nd inning, which is very odd for Utley, and that cost Oswalt the unearned run. Things got stranger in the 6th; Carlos Ruiz was hit in the knee with a pitch by another ex-Phillie, Arthur Rhodes. Ruiz seemed to be fine and Rhodes was lifted from the game. Pitcher Logan Ondrusek replaced Rhodes and only 3 pitches later, he nailed pinch-hitter Ben Francisco in the head to load the bases. Luckily for Francisco, he moved his head quick enough that the ball hit the brim of the helmet. So although it looked very scary, he was okay. Shane Victorino walked next to score a run. So the Reds had 4 errors through 7 innings in this game, which the Phillies then led by a score of 6-4. Ryan Madson erased the Reds in the top of the 8th. In the bottom half, Utley singled and stole a base, still determined to erase the errors from everyone’s minds. Jayson Werth knocked him in to add on an insurance run for a 7-4 lead. That set up the 9th for Brad Lidge. Despite walking the first batter he faced and making the fans grumble, Lidge buckled down and got the next 3 batter out to put the Phillies up 2 games to none in the NLDS. The Phillies are one win away from advancing! Cole Hamels will pitch in Cincinnati on Sunday at 7:00pm.